Recent research figures released by Ipsos, a world leader in market research, for the month of March 2012 pegged India to be the 2nd most economically confident country. More Indians believe that the current economic situation in India is good and are upbeat about the progress of the Indian economy in 6 months. This puts India ahead of USA, Australia, Canada, Great Britain and even China. The survey called – Global @dvisor: Economic pulse of the World – interviewed 18,775 respondents via the company’s online system called the Ipsos Online Panel System which is used every month to collect information from respondents in 24 countries. Respondents assessed the current state of their country’s economy for a total global perspective. The survey quizzed respondents regarding views about their country’s current macroeconomic state, how they perceive the state of their local economy and their outlook for their local economy in 6 months time. A massive 79% of the Indian respondents said that India’s current macroeconomic state was somewhat good or very good. In simple words, nearly 4 out of 5 Indians think that the current economic situation in India is either very good, or somewhat good. In July 2011, only 62% of the Indian respondents felt the same, improving slightly to 65% in January 2012. 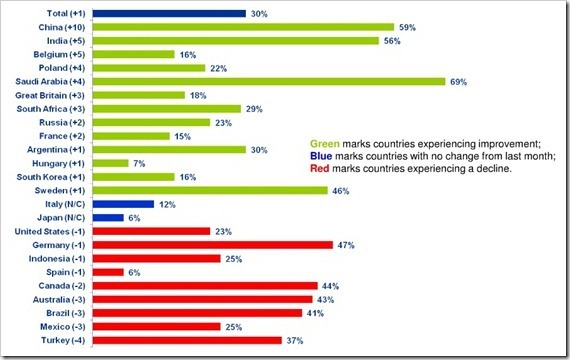 Ipsos marked out India specifically as a country that was experiencing improvement in this regard. In fact, India tops amongst all other Asian countries in this survey. India fared 2nd, only after Saudi Arabia (89%) amongst all 24 countries including China (71%), Canada (64%), Australia (62%), USA (22%) and Great Britain (14%). Portugal (2%), Spain (4%), Hungary (4%) and Italy (6%) are the countries whose citizens are least confident about the current economic situation of their local economy. That’s not the only reason for India Inc to rejoice. As compared to the previous months, India is the 2nd most improved country whose respondents have confidence in the local economy. China was the most improved with 10% of the respondents having increased confidence in the local economy, as compared to 5% for India. The big question is, how do Indians feel about the local economy 6 months from now? As per the Ipsos survey, 57% of Indian respondents believe that the Indian economy will get much or somewhat stronger in the next 6 months. Going back to July 2011, only 43% felt the same while 50% of the respondents echoed similar opinion in January 2012. 71% of Brazilians and 29% of Saudi Arabians think that their local economies will fare much better in the next 6 months. The fact that 4 out of 5 Indian respondents rate the current macroeconomic situation in India as very good or somewhat good, is a record highest. March proved to be a stellar month for Automakers in India as Tata Motors, Mahindra & Mahindra, Maruti Suzuki India and many more saw record jumps in sales. Recently, the RBI relaxed lending rates and some of the banks have already happily passed on these cuts to customers. As RBI announced the 50 basis point cut in rate, analysts and experts came out with high hopes for GDP growth, business, housing and an overall better economic environment. The AGNI-V launch was a display of strength as India flexed its muscle to join the few other countries in the world which are capable of launching an Intercontinental Ballistic Missile (ICBM). Despite all the positivity, the movement in the markets have remained nearly status quo since the budget was announced more than 5 weeks back. The market has been choppy and as this post come to you, BSE lost nearly 1.6% as it fell 277 points to 17,096 and the NSE lost about 1.71% as it fell 90 points to 5200 today. Year end results are coming out and major players like HDFC and TCS have posted stellar results while Infosys has disappointed. We are yet to see something that triggers a trend, whether upward or downward. If the Ipsos survey is anything to go by, at least the morale of Indian respondents seems high and their confidence in the Indian economy is rising. India shining? Wait and watch. Saudi Arabia No.1 and we are associated with both! lol but i am not sure of the source……. Yes, India is becoming stable and economically strong . But still there are a large portion of people in India struggles from lack of finance and resources . ANyway we hope within a short period it would be cleared and india becomes leader . Look! Indian economy has plenty of opportunity and talent but it needs a proper direction that will come from proper governance. All businesses from around the world are looking to invest in India and targeting it as focus potential market then why we should not believe and should not be confident that India is economically very strong. The confidence of people about their countries economic situation is very important. India is lucky to have this at this difficult juncture. 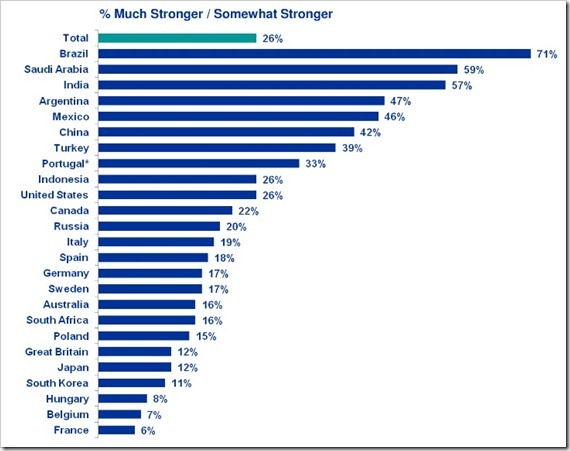 People are aware of the intrinsic strength of the economy and the survey reflects that. Let the government and agencies understand and utilize the situation by taking favorable decisions for growth.